Assembly and Time: Assemble at 48 West 48th St., at 3:20 p.m. between Fifth and Sixth Aves. and between Counties Carlow and Wicklow. Good news from the Parade Committee: in the future all the county associations will have an opportunity to take their place up front in the parade every third year. Dress Code: Please remember that the St. Patrick’s Day Committee strictly adheres to the following dress code: no sneakers, jeans, or inappropriate dress and head gear. Laois Grand Marshal: We are delighted to announce that our Association member, Laois author and Mountmellick native Tom Phelan, has accepted our invitation to be this year’s Grand Marshal, leading us up Fifth Ave. in the parade. When his debut novel was published in Ireland, one enthusiastic reviewer wrote, “Where has Mr. Phelan been?” Tom did not disappoint but went on to publish five more novels and is currently at work on his seventh. He has seen his work published in four countries and three languages. In addition, Tom's memoir pieces about growing up in Mountmellick appear regularly in the Irish Echo; the latest, “Wasted on the Bog Air,” is in the March 8-14 edition (http://irishecho.com/2017/03/87947/). Mountmellick residents were so inspired by his World War I novel, The Canal Bridge, that they erected a fine monument to the many local people killed on the battlefields of Europe. Laois Visitors: We are also happy to announce that Laois County Council representatives Tom Mulhall, the Cathaoirleach (Chairman), and Gerry Murphy, representing the Chief Executive, together with their wives, will join us in the parade on Fifth Ave. They also hope to attend the mass in St. Patrick’s Cathedral and the Business Summit on Ireland-U.S. Economic Relations, as well as a meeting with the Irish Development Authority (IDA) before they leave New York. Bill McEvoy: Incredibly, Bill, now at 94 years, will be the most senior person marching in the parade. This past year, however, was a very tough one for Bill. Not only did he lose Lile, his beloved wife for 65 years, but also his daughter Miriam O’Grady, as well as his sister and brother in Ireland. On behalf of the Laois Association we extend our heartfelt sympathies and condolences to him. Bill has an amazing resume, being a founding member of Comhaltas Ceoltoiri Eireann (CCE) in the U.S. and Canada and spearheading its vast expansion across North America during his 25 years as its chief executive. Under his watch the first traditional Irish music concert tours were organized and grew into an annual event, which contributed to the formation of 40 branches of the CCE with over 3600 members. Since his retirement as chief in 1987, Bill has received the highest accolades from Comhaltas in Ireland, including Irishman of the Year award, and President for Life of CCE in North America. Bill continues to be active in playing the fiddle in his own band at many functions, writing, organizing, traveling and enjoying his large family of children, grandchildren, and great-grandchildren. He’s off to Chicago and Dublin on CCE business in the coming weeks. “Go n’eiri an bother leat”. Launch of Tom Phelan Novel: The paperback of Tom Phelan’s acclaimed novel Lies the Mushroom Pickers Told will be launched on Tuesday, March 14, at 7:30 p.m. in the Garden City Library, Seventh St., Garden City, NY. Sponsored by the Irish Cultural Society, this event is free and open to all. Apart from his novels, Tom has written for Newsday, the Irish Echo, the journal of the American Irish Historical Society, and others. He has given readings and talks at Villanova and Hofstra Universities, NYU Ireland House, American Irish Historical Society, Irish American Writers and Artists, and scores of other venues. Last fall, he was awarded a writer’s residency at Obras Portugal in Evoramonte. Patricia Phelan, Tom’s wife, works as a professional genealogist, specializing in Irish and American research. She is program director for the Irish Family History Forum, which meets monthly in the Bethpage Public Library. (glanvil3@aol.com). We would greatly appreciate it if our members would send us their email addresses as well as the names of potential members for our Laois Association. 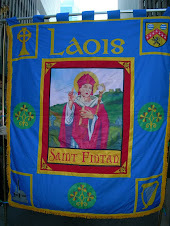 Laois Blog: www.nylaoisassociation.com for previous years’ photo galleries, etc.